The efficacy of even the most ambitious government programmes depends on the willing participation of the employees who come in direct contact with the intended beneficiaries. The people who disseminate the fruits of the Integrated Child Development Services (ICDS) among the expectant and nursing mothers and children below six years are anganwari workers. Maulana Ghulam Mohammed Vastanvi came to Darul Uloom on the promise of change. The first non-alumnus to be appointed Mohattamim (Vice-Chancellor), he wanted to make the curriculum more broad-based, and he wanted the Islamic community to focus on the future. Land deals are running into trouble not only in Uttar Pradesh but also in Haryana and Punjab, where the supposedly farmer-friendly governments are taking a hard line on land acquisition. The Mayawati government had used the emergency clause to take over farmers’ land originally for industry but handed it over to builders. Averages, percentages, rates of growth, indices, inflation rates etc are the statistics that hide more than they reveal. These are convenient for mundane justifications and sometimes are used to deliberately mislead the public or whosoever they are addressed to. For example, averages do not represent any of the individual figures. Anil Kapoor and yours truly are credited to have started the trend of (3-5 day) stubble. Since 9 out 10 people, especially the purists, who meet such folks with a stubble think that the latter may not be feeling too well — down with fever etc — it takes a lot of courage to look what you like to look. On the 12th Anniversary of the Kargil war, it would be appropriate to reflect on the key strategic lessons of the war and the geo-political changes that have come about in the Kargil-Siachen-Ladakh Sector since then. The efficacy of even the most ambitious government programmes depends on the willing participation of the employees who come in direct contact with the intended beneficiaries. The people who disseminate the fruits of the Integrated Child Development Services (ICDS) among the expectant and nursing mothers and children below six years are anganwari workers. But a Planning Commission study has pointed out that they are an ignored, dissatisfied lot because the governments refuse to give them their due. Till recently, the Centre was giving them only Rs 1,500 per month which was ultimately increased to Rs 3,000. The states were supposed to top up their monthly salary by another Rs 1,000, but have been miserly in releasing this “princely” sum. As a Tribune report pointed out, Bihar, Nagaland and Arunachal pay them nothing, while Meghalaya pays only Rs 50 a month, as if the health of the children is solely the responsibility of the Centre. The plight of anganwari helpers is even worse with a salary of only Rs 1,500. Anganwaris themselves are in a state of utter neglect. Sixty per cent of them do not have safe drinking water or toilet facilities. Seventyfive per cent do not have kitchen facilities and cooked food is left exposed to hazardous materials. Eightyfour per cent of the centres in Haryana are unclean; not even one of those surveyed in Punjab had clean toilets. Only a brave mother or child would venture to go to such a place. With thousands of crores of rupees being poured into the ICDS, the anganwaris can still be turned around, if only the governments show some compassion for the famished children. The stench of neglect was all-pervasive in the 1,500 anganwaris surveyed between 2008 and 2009, but there were exceptions. The Dadumajra centre in Chandigarh stood out as an island of excellence delivering nutrition, health and pre-school education efficiently. That shows that there is nothing wrong with the scheme per se. It’s only the implementation which has gone horribly wrong. Maulana Ghulam Mohammed Vastanvi came to Darul Uloom on the promise of change. The first non-alumnus to be appointed Mohattamim (Vice-Chancellor), he wanted to make the curriculum more broad-based, and he wanted the Islamic community to focus on the future. The Islamic seminary, which dates back to 1866, holds a pre-eminent place for Sunni Muslims, and its teachings and religious edicts have wide following. Vastanvi’s “misstep”, his allegedly praising the development work done in Gujarat under Chief Minister Narendra Modi’s stewardship, something he denied later, raised tempers within the campus and in the Muslim community at large. It eventually cost him his job. While there is no doubt that the administrators of Darul Uloom were meticulous in following procedure in removing the Vice-Chancellor, who seriously misjudged the sentiments of the community he sought to provide leadership to, political machinations have also been widely reported. Darul Uloom has a long history of guiding Muslims, in India and outside, by providing them with clear interpretations about the teachings of Islam. Many of its fatwas have earned high praise for their secular orientation and clarity of thought. A change of head in this institution will be an occasion to re-examine its priorities and make it more effective in dealing with the demands of a modern pluralistic world. The Vastanvi controversy has put the onus on the new administrator to show that he can, indeed, rise up to meeting the challenges of an ever-changing society and show how change that was sought to be effected by his predecessor will continue. It is time for Darul Uloom to focus on teachings and their dissemination to students, so that they continue to interpret Islam in the true sprit of the religion. Land deals are running into trouble not only in Uttar Pradesh but also in Haryana and Punjab, where the supposedly farmer-friendly governments are taking a hard line on land acquisition. The Mayawati government had used the emergency clause to take over farmers’ land originally for industry but handed it over to builders. The Supreme Court recently scrapped some of these deals, helping farmers but hurting home buyers, who too are crying for a fair deal. More such cases from Greater Noida are pending with the Supreme Court. Encouraged by favourable court rulings, farmers are challenging deals in which they feel they have been short-changed. Land prices shoot up once housing or commercial projects are announced and farmers feel cheated. Punjab too is in the thick of farmer unrest. The government used excessive force on Saturday to acquire 880 acres in Mansa district for a thermal power plant to be built by a private company. Some 400 farmers were arrested. The administration claims more than 90 per cent of the land-owners had taken the agreed price. But rehabilitation terms are being reworked everywhere and relief is also considered for farm workers. In Haryana the government decision to take over farmers’ land for setting up a nuclear plant at Gorkhpur is being contested by the affected farmers. Here, the price of land or quantum of compensation is not as much in dispute as the very location of a nuclear power project, which villagers feel could be detrimental to their well-being. Ideally, before launching a project, villagers’ consent should be taken, especially if the merits or benefits of the project are disputed in addition to a reasonable rehabilitation package. The government is legally empowered to forcibly take over land for a public purpose. But it is under pressure from courts and the public to make terms of the deal fair and just. The draft of the new Central Bill on land acquisition reflects this sentiment and limits government intervention to 20 per cent, which means 80 per cent of the land-owners must agree to willingly part with their landholding. Governments should also exercise restraint and tact in dealing with emotive land issues, which could flare up if mishandled. Averages, percentages, rates of growth, indices, inflation rates etc are the statistics that hide more than they reveal. These are convenient for mundane justifications and sometimes are used to deliberately mislead the public or whosoever they are addressed to. For example, averages do not represent any of the individual figures. Average size, height, weight, length, breadth do not represent any individual variable. If one person is six feet tall and the other is four feet, the average height will be five feet and that figure will have no meaning. Another example: If one calculates the average depth of a stream to be crossed and finds it less than his height up to waist, he may drown while crossing the stream. Similarly, rates of growth depend upon the base used. The rates of growth in GDP, productivity, population etc. do not provide the basis to compare different sets of data. One percent growth in population in India does not compare favourably with even 2 per cent growth in the sparsely populated countries of Africa or South America. For example, 1 per cent growth on one thousand population means an addition of 10 persons and a 2 per cent growth on a base of 100 persons will be an addition of only 2 persons. In the same way, agricultural productivity and production growth in Punjab, Haryana, Western UP and even Andhra Pradesh will remain lower than that in Gujarat, Bihar and Rajasthan because of the higher base of production and productivity in the former set of states even though the gross addition to productivity and production in these states might be much higher. Thus the rates of growth in these states are not comparable statistics. Then look at the rates of inflation. When the rate of inflation increases, it certainly increases the prices of the commodities. Yet, in case the rate of inflation decreases, it does not mean the prices of the commodities in the market have come down. In a declining rate of inflation, the prices still keep increasing, but at a slower rate. This mollifies psychologically the consumers and other users of the commodities with no relief on the higher and higher prices they would continue to suffer from. Just a few days ago Union Food Minister K.V. Thomas tried to counter the fact of huge wastages of food grains due to lack of proper handling and scientific modern storage facilities. He mentioned that spoilage is only 0.1 per cent of the stocks handled. Undoubtedly, this low figure quoted by the minister looks to be unbelievable. The other day there was news of 80,000 quintals of wheat rotting in the open at one place. This cannot be a singular case. We have seen the track record of export consignments rejected and not an insignificant level of below standard supplies in the public distribution system as well as the deplorable plight of stored grains in the open and on plinths for months together. Yet believing him for a moment, 0.1 per cent loss means approximately 20,000 tonnes of grain annually from Punjab alone. Going by the present prices and storage as well as handling costs, it amounts to a very reserve estimate of loss of more than Rs 30 crore in one year in the state. If this loss is calculated for the last 30 years, it far exceeds the amount needed for the construction of metallic silos for more than 15 million tonnes to food grains. This loss is more than double this figure at the national level. If the system saves this much grain in silos, there would never arise any need for imports at exceptionally higher prices from the international market and exports could be made as per demand from outside at good prices. If the stocks are managed properly and stored scientifically, the FCI could turn into a revenue-earning organisation rather than a drain on the national exchequer. The basic expectation from the Food Corporation of India was that the organisation would earn some revenue for the government. In the initial two years the organisation did turn in some profit for the government. What spoiled the game was the laxity on the part of the management of the FCI. Way back, three decades ago, it was estimated that if a bag of wheat was procured at the minimum support price and handled as well as stored for three years the way it was done by the organisation, it would cost the government more than the cost of distribution free to the needy right from the market yard where the grain is procured. The Supreme Court of India directed the government last year to distribute grains free to those below the poverty line rather than waste these as was being done by the organisation due to lack of proper handling and storage. Still, the matter is being taken lightly and percentages are being quoted to cover the default lines. Indian ethos and culture regard as God (Ann Parmeshwar hai). The wastage of even a single grain is considered to be a sin! Unfortunately, our government system considers thousands of tonnes of grain wastage insignificant. Look at the effort which goes into the production of these grains right from the preparation of land, sowing seeds, nurturing the crop, harvesting, handling and the costs and effort involved in bringing these grains for the kitty of the government. And, the government makes light of the grain wastage! It is not just the wastage, there is corruption in handling grains and supplying these to consumers through the public distribution system. A World Bank report has estimated that 60 per cent of the grain supplies for distribution through the PDS in India do not reach the depots. These get sold straight in the open market. In corruption Punjab excels all other states. Here 90 per cent of the food grains supplied for the public distribution system are sold directly in the market. One wonders, where the government system and the authorities that be, are taking the country through utter laxity, insensitivity and corruption. If the situation does not take a healthy turn-around, the time is not far when the nation would be helplessly staring at the dark precipice of disaster on the food front. The writer is a well-known economist. I have often preached: “When young, adjust your hair according to the existing hair-style; when old, adjust your hair-style according to the existing hair.” And thus a saga of hair-styles over the years. But last week when I reached home after a hair-do, permed and coloured with a special dye that I brought from abroad, and unkempt as ever, I didn’t realise what was in store for me. The reaction from my family members, whom I nurtured all my life with my sweat and blood, was beyond my imagination, to say the least. In the evening, when my 12-year Johnian first saw his father (in new avataar), he exclaimed with shock: “Oh! Your beautiful brown hair resemble that of my friend’s dog.” I smiled and gave him the benefit of doubt that he might have inherited some humour and hoped that he didn’t see any four-legged creature below that hair. Victorious Indian soldiers pose atop the formidable Tiger Hill during the Kargil War. Historically, Kargil war was the second limited conventional war between two nuclear weapons armed nations over territorial dispute, the first being the Sino-Soviet border conflict on the Ussuri River in 1969. In the Kargil war, the Pakistan Army tried to make use of the nuclear threshold to grab Indian territory in the garb of militants. The experience shows that as long as there are territory-related disputes, despite nuclear weapons deterrence rationality, the adversaries can indulge in limited border wars. In fact such wars have now become a more likely norm in the strategic environment where large scale capture of territories, forced regime change and extensive military damage on the adversary are ruled out. India’s defence planners have to bear this in mind as two of its largest neighbours, China and Pakistan, possess nuclear weapons and have longstanding territorial disputes with India. 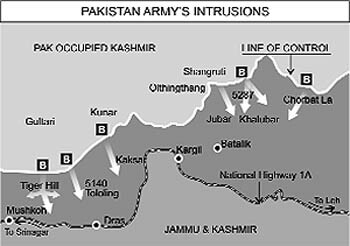 In the Kargil war, Pakistan attempted to make use of its proxy war with India to escalate it to a regular conventional war. That was a repeat of Pakistani war initiatives in J&K in 1947 and 1965. India’s intelligence agencies and armed forces must cater for such a contingency, particularly while defending J&K territory. A major military challenge in India is the political reluctance to a pro-active grand strategy or engagement. This disadvantage is enhanced because no loss of territory is acceptable. This is a strategic handicap and a risk in any war setting, which increases in a limited war scenario. It implies greater attention to surveillance, committing large force levels along the borders/ LoC and thus depletion of combat reserves. A pro-active grand strategy and capability to wage a successful conventional and nuclear war is a necessary deterrent. A war may remain limited because of credible deterrence or Escalation Dominance, when one side has overwhelming military superiority at every level. The other side will then be deterred from waging a war. (Over the years, we have managed to erode such a deterrence capability.) That also gives more room for manoeuvre in diplomacy and in conflict. The new strategic environment calls for speedier, more versatile and flexible combat organisations in mountainous as well as non- mountainous terrain. The successful outcome of a border war depends upon the capacity to react rapidly to an evolving crisis. The new strategic environment in wars requires close political oversight and politico-civil-military interaction. It is essential to keep the military leadership within the security and strategic decision- making loop. Information operations are important due to the growing transparency of the battlefield. The political requirement of a military operation and to retain the moral high ground, (and deny that to the adversary) needs a comprehensive media and information campaign. When Kargil war broke out, our holdings and reserves of weapons, ammunition and equipment were in a depleted state due to continuous lack of budgetary support, tedious procurement system, and raising of units without sanctions for weapons and equipment. To the media, I had to say “We will fight with whatever we have”. The war highlighted gross inadequacies in the nation’s surveillance capability. To some extent, this has now been made up with indigenous satellites, Unmanned Aerial Vehicles, thermal imagers, surveillance radars and ground sensors. That apart, the modernization of armed forces continues to lag behind due to the absence of holistic and long-term defence planning, complex acquisition procedures, fear of scams and inadequate self reliance. Despite a large net work of Defense Research and Development Organisation laboratories, Ordnance factories and defense public sector undertakings, we continue to import over 70 per cent of our weapons and equipment. So far, the Defense Procurement Organisation has failed to speed up the process. What we require is an integrated acquisition structure with relevant expertise under one roof and under one controlling authority to oversee the entire process of acquisition, right from the planning process to the final disposal of the weapon/platform. There is no point talking about revolution in military affairs, information systems and net centric warfare if we cannot even induct relevant weapons and equipment in time. The armed forces have followed up on most of these lessons. For example, action has been taken to improve all weather surveillance and closer defence of border and lines of control. Individual service and joint services doctrines have been revised. Some Special Forces units have been added to the strength of each service. At the politico-military strategic level, however, there has been little progress. After the war, the government had carried out a National Security Review in 2001-02. Many reforms were recommended to improve the higher defense control organisation, its systems and processes. Changes made so far have only been cosmetic. The willingness and spirit to change has been lacking. The National Security Review had recommended the appointment of a CDS to provide single point military advice to the government and to resolve substantive inter-service doctrinal, planning, policy and operational issues. This is necessary because in India, turf wars, inter service rivalries, bureaucratic delays and political vacillation in decision making become major hurdles in defence planning and its implementation. In the new strategic environment of unpredictability and enhanced interactivity, it is essential to create synergy and optimise defence and operational planning. A face to face dialogue and military advice is critical to success in politico-military-strategic and operational issues. The creation of the post of CDS is still pending and interaction between the political authority and service chiefs continues to suffer due to inter service rivalries and the dominant position retained by the civil bureaucracy. In this context, the recent appointment of a committee under Mr. Naresh Chandra to review defense reforms in India is a welcome step. Twelve years after the Kargil war, the security situation in Kargil-Siachen-Ladakh has deteriorated further due to the Sino Pakistan nexus and deployment of PLA troops in the Gilgit-Baltistan area of Pakistan Occupied Kashmir. Two years ago, a Ministry of Defence report had stated that ‘the possibility of China and Pakistan joining forces in India’s farthest frontiers, illegally occupied by the two neighbors, would have direct military implications for India’. That possibility has become a reality now in the light of several credible reports of the presence of Chinese troops in the Gilgit-Baltistan area. The Chinese military presence in the area, purportedly to repair, upgrade and re-commission the Karakoram Highway and to improve infrastructure, became visible last year. This has a direct bearing on our defenses in the Kargil-Siachen-Ladakh sector. The Chinese would not be pointing guns towards our posts but the fact that they are co-located and working alongside Pakistani troops reflects joint strategic interest and enhancement of operational preparedness. It should be noted that the Chinese have been willing to negotiate and settle the boundary issue of J&K (West of Karakoram Pass) with Pakistan but have refused to discuss that boundary with India on the ground of it being ‘disputed’. The Chinese have been stapling visas for Indian citizens belonging to J&K. With China becoming a new, assertive factor, the dispute over accession of J&K to India is no longer a bilateral issue but a tri-lateral issue between India, Pakistan and China. In the security scenario and defence planning for the North Western sector, Indian armed forces have no alternative but to factor in joint, two front Pakistan-China threats. The Kargil war was not the first time when Pakistan initiated a war. In the present circumstances, when the ISI continues to wage proxy war through its jehadi organisations, we cannot assume that it would be the last time. Every good military would like to be pro-active. But it has also to develop the will and capability to react. The essence of military leadership lies in the manner in which we react to restore a situation, however, adverse the circumstances of the battle. An enduring lesson of the war is that for national securit. Sound defence enables sound foreign policies. Cause: Pakistani troops occupied about 130 vacated posts on the Indian side of the LoC. Significance: Pakistani aim was to interdict the critically important National Highway 1-A, thereby cutting off Ladakh from Kashmir. Result : Pakistani troops evicted. Tactical and diplomatic victory for India. May 5: Army patrols sent up; Five Indian soldier captured and tortured to death. June 5: Indian Army releases documents recovered from three Pakistani soldiers indicating Pakistan’s involvement. June 11: India releases intercepts of conversation between Pakistani Army Chief Gen Pervez Musharraf, while on a visit to China and Chief of General Staff Lt Gen Aziz Khan in Rawalpindi, as proof of Pakistani Army’s involvement. 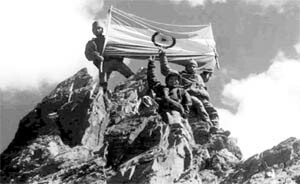 July 5: Indian Army takes control of Dras. Sharif announces Pakistani army’s withdrawal from Kargil following his meeting with Clinton. n In a headline on Page 2 of the July 23 issue Reoti Raman has been wrongly spelt as Reoti Rama. n In the second deck of the Hero Honda results report on Business page of the issue of July 22, which reads “1st rise in profits after four quarters of declines”, the word ‘decline’ in singular would have been appropriate. n It is odd for both decks of a headline to mention the name of the city as in the Panipat report on the Haryana page (Page 7) of the issue of July 24.
n In the report “SAD-BJP targets urban voters” the word impressive has been mis-spelt as “impresseive”.